An indispensable guide to the art/skill of giving truly manly hugs. Pastor Dan completes his study on Hebrews 11. Put all of your trust in Jesus Christ. Know that his sacrifice was sufficient for your salvation. And you shall stand strong in the sufficiency of his grace to overcome temptations and endure trials. This real Ebay auction caused my usually quiet wife to laugh out loud (make sure you read the description of the item). Matt's Messages - Go Fish! Well, it’s time to go Back 2 School. Does anybody know what a “student” was called in Jesus’ day? Someone who was a learner, a student, a follower of a teacher? “Disciple” means a follower, a student, a learner. And today, we’re going to look at the story of Jesus calling his first disciples. I invite you to turn with me to the Gospel of Matthew chapter 4. JESUS’ DISCIPLES FOLLOW JESUS AND THEY FISH FOR PEOPLE. Simon and Andrew, James and John. Two sets of brothers. One day, they were fishermen, the next day, they were fishers of men. But on this fateful day, Jesus approached them and called them to give up their nets and their businesses, and even (in priority) their fathers, and join Him in a great Kingdom task–fishing for men. V.19. Two things I want you to see this morning. Two things that Jesus requires of His students, His followers, His disciples. #1. JESUS’ DISCIPLES FOLLOW JESUS. AND #2. JESUS’ DISCIPLES FISH FOR PEOPLE. The first one seems pretty obvious, but ironically, we ignore it a lot. That’s a pretty clear call. And it’s a very personal call. That means, what He says, goes. Remember our re-focusing time last week? God is telling us that we need to RE-FOCUS on God Himself [UP], on the Church [AROUND], and on the World [OUT]? We asked some pretty pointed application questions last week. How are we doing at them? The first question I asked was about Re-Focusing on God (from Matthew 22). Do you have a regular appointment for one-on-one time with God? How have you have done on that this week? God wants to meet with you more than you want to meet with Him! Do you have a regular appointment for one-on-one time with God? When is the next meeting going to be? Those questions, I think, are a matter of FOLLOWING. Jesus’ disciples follow Jesus. And this is what Jesus wants. A number of you told me this week about changes you are making to your personal lives and schedules to answer these questions. That’s awesome! Are you regular in Sunday morning attendance? Are you connecting with other believers? Are you serving the Lord in the local church? But what I really want us to think about today is that third area of re-focusing. Specifically, re-focusing on the world. Because Jesus’ disciples don’t just follow Him generally, they follow Him in a very specific way in Matthew 4:19. They fish for people. Now, this is not how Simon, Andrew, James and John did their fishing. They used big circular nets that caught the fish in a big jumble and then they hauled it up onto the boat and dumped out their catch and then started again. We are called, not to go after bluegill or trout or salmon, but after people with the gospel. Jesus’ Disciples Fish for People. And this FISHING is not optional! I would imagine that Andrew, James, and John might have said the same thing. They were fishermen, not salesmen! Of course, old Peter thought he could do whatever he wanted to do! But this is not optional for Jesus’ disciples. Jesus’ Disciples Fish for People. It’s part of the definition of a disciple. If you aren’t a people-fisher in some way, shape, or form, you aren’t a disciple. Of course, this isn’t something we do on our own. Jesus says that He will make His disciples fishers of men. It’s something Jesus does in us and to us and through us. But we have to make ourselves available to Him. We have to follow and we have to fish. If we are going to be disciples of Jesus Christ, we must be people who go after people with the love of Christ and the Gospel of Christ. We need to go fishing. The last application last week was focused on fishing for people. I reminded us of Jack Kelly’s story from two weeks ago when he said that his church had knocked on literally 100,000 doors in 10 years. Is there someone on your mind and heart right now that you can begin to pray for that they would come to Christ by Resurrection Sunday in March? And I said, “Let’s do this: Let’s all think of someone that we want to reach out to like that. Or maybe a group of someone’s and we don’t know which person exactly it will be, but we’re going to pray and then get into their lives with the Gospel so that each one will win one to Christ. And I said that this week, we’d have a way of writing down those people and focusing our prayers on them together as a whole church. And that’s these [FISH CARDS]. Take out your FISH CARD. Your FISH CARD says, “I’m praying for and hoping to catch...” and then there is a place for you to put their name or a group’s name. Let’s say you’re trying to reach out to guys who take their coffee break at the same time you do at work. Put that down. And then there’s a place for your name so that we know who is praying for and hoping to catch whom. Can you fill one of these out today or this week? You can fill out more than just one card if you’re willing to both pray and fish for that person to come to Christ. We’ve put a fishbowl out in the foyer to collect these. We’ll be praying for them at our prayer meeting every Wednesday night. And we will be fasting for them, as well. I am personally going to take one meal a week off and dedicate it to praying for these people. And I invite you to do it with me this Fall. Everyone is invited to pray and to fast. Kids, if your parents will let you. Everybody. If you can’t go without food, try going without television or something else. And there are also these to give away [FLYERS]. These are flyers about the church and about Family Bible Night that’s going to start on September 12th. They aren’t the Gospel, but they are a means of connecting lost people to the Gospel. Can I encourage every one of you to take some of these and give them to kids and parents in your neighborhood and invite them to come to Family Bible Nights this Fall? Maybe kids, you could take these to school with you this week and give them to your friends and enemies! I’m going to stuff my pockets with them and give them away to kids that I meet. I gave away 16 of them already this week. We’ve got to go fishing. THE LAST, THE LEAST, AND THE LOST. I’ve asked 3 members of our church family to come up here and share about how they have reached out and are reaching out to the last, the least, and lost. And how it’s going. Judy, Dan, and Anita. Would you come up here one at a time and tell your stories? Are you willing to pray and to fast for folks like these? It’s going to take some effort. It’s going to cost something to reach our community. Simon, Andrew, James, and John had to leave their nets. James and John had to leave their Dad! Jesus had to leave His Father! And we’re following Him on this fishing trip. What are we going to have to leave to reach our community with the only message that can save them? The Gospel! The good news of Jesus’ coming, Jesus’ perfect life, Jesus’ sacrificial death, Jesus’ victorious resurrection, Jesus’ call to repentance and faith, Jesus’ promise of eternal life to all who receive Him. The Gospel! That’s what we need to hook our community on! A few weeks ago, I ran a Google search on the demographics of our community. The most recent census data shows that there are 7,700 people in the West Branch Community. And that doesn’t count the rest of the Moshannon Valley or anywhere else that people in this room are from. That means that there are over 6,000 people in a 10 mile radius of this church that aren’t following Jesus in church this morning. They are out there and they need us to go fishing for them with the Gospel. There’s a whole school of fish right down the street. If you are going to West Branch this week, can I ask you to stand? I mean students, staff, teachers, administrators. If you are going to West Branch this week, please stand. Okay. If you are going to a Philipsburg School please stand. Okay. If you’re going to a Clearfield School this week, please stand. Okay. If you are going to Penn State this week, please stand. It’s Back 2 School Sunday. You folks are our missionaries to these schools. GO FISHING! Go get ‘em! Don’t just go to school. Go Fish! Okay. If you are going to work this week, please stand. Anywhere. If you are going to work, please stand. You folks are our missionaries to those workplaces. GO FISHING! If you are going to go anywhere this week [Wal-Mart, the Marketplace, the Soccer Field, the Pumpkin House], you are our missionaries to those places. As you’re going, GO FISHING. GO FISH. In May, our family went to Ocean City Maryland for our family vacation. And on the last day, at the end of the board-walk, we toured the Ocean City Life-Saving Station Museum. Maybe many of you have done the same thing. The museum tells the story, with historical artifacts, of the US Life Saving Service which eventually merged with another group to become the Coast Guard. The men of the US Life Saving Service would go out to sinking ships and try to rescue people off of them. Over a hundred people could die on a sailing ship that broke up within sight of the shore. And while I was there at the museum, seeing what time and devotion and risk those men took to save people’s physical lives, I was moved, almost cried, to think about how little we work and risk to save people’s eternal lives! We need to go fishing, brothers and sisters! We need to go fishing! Because Jesus’ Disciples Follow Jesus and Because Jesus’ Disciples Fish for People. Read a Good Book (or Sentence) Lately? John Piper's most recent sermon is really helpful for thinking about the origin of evil and what to think about evil and Satan today. Dan Ledford on the Faith of Moses, etc. The Monkey Tower is done and in operation! I'll post more pictures soon from last week and our grand opening celebration. Praise God! I know that I’m going to disappoint you by not preaching on Numbers 28 this morning. I’m sure that for the last 2 weeks many of you have been chomping at the bit to know about the religious calendar of Israel in Numbers chapter 28! But this week, I felt the Lord leading me in a different direction for this Sunday’s message. I have felt the Lord putting together various thoughts in my heart for several weeks now, especially during my mini-sabbatical, thoughts that I might share after Numbers and when Fall officially began. But this week, those thoughts came together in a way that made me think it was time now to share them. And they are all about re-focusing. I was reading a book this week that told the story of the Hubble telescope. Remember the flap over the Hubble telescope? “The Hubble telescope was launched from the space shuttle Discovery on April 24, 1990. Expectations were high from the beginning, as astronomers anticipated new discoveries and verification of their hypotheses and theories. At launch time, the Hubble project had cost over $1.5 billion to create what would be the world’s most powerful and accurate telescope. The primary mirror, nearly eight feet across and weighing nearly a ton, was ground as close to perfection as humanly possible. The curve did not deviate by more than 1/800,000th of an inch. According to Hubble officials, if this mirror ‘were scaled to the dimension of the Earth, the biggest bump would only be six inches tall.’ Perched 353 miles above the Earth, the Hubble had an unobstructed view and could peer light years into space to observe previously undiscovered galaxies. But there was a problem. Soon after the Hubble was set in orbit, engineers discovered that the main mirror was flawed. Objects that were supposed to be clear were fuzzy. The problem was not power or size. The problem was focus. The Hubble had to be repaired. So in December 1993, astronauts aboard the space shuttle Endeavor fitted the mirror with corrective optics. The mission was a complete success. The repairs corrected Hubble’s previously blurry vision and allowed the telescope to explore the universe with unprecedented precision and clarity. Only when the Hubble was focused, could it carry out the mission for which it was created. Size is important. Power is important. But focus is everything” [The Externally Focused Church, pg. 35-36]. I have felt the need to re-focus for some time. My mini-sabbatical was a time of re-refocusing–re-adjusting my priorities and systems of life to reflect what my priorities and systems should be. And I think that many of us, and probably all of us to some degree or another need to re-focus. Because, whatever we focus on directs us. Have you ever noticed something lying on the road as you drive down the road? And you want to swerve to miss it, but you focus on it, you stare at it, what normally happens? You hit every time, right? That’s because whatever has your focus, has your attention, directs you, directs your life. And there are lots of things that compete for our attention, that fight for our focus. And on a regular basis, you and I need to come back again to adjust our lenses and remember what’s most important. What do we need to focus on. Remember the Big Rocks that we talked about back in January? We talked about how if you don’t put in the Big Rocks first, they won’t get in? And we talked about making a Big Rocks list and focusing our lives on it this year. How many of us made a Big Rocks list? And are we still focused? I think that we need to re-focus. And I have been thinking about three areas that I need to re-focus upon and I think most of us do, too. #1. WE NEED TO RE-FOCUS ON GOD. I’m sure that you expected me to say that, but it’s true isn’t it? Let’s look at what Jesus says in Matthew chapter 22. Look down at verse 34. The Pharisees thought that they had Jesus in a bind. This expert in the law did not have a sincere question. He was trying to trip Jesus up with a debate that had gone on for centuries as to which of the commandments in the Old Testament (at least 600 of them) was the weightiest. If he could get Jesus to say something that would anger one group or another by taking sides, then Jesus would lose followers. But Jesus doesn’t take the bait, and in fact, knows what is the most important, the biggest rock, the greatest commandment that there is. Notice that big three letter word there: A-L-L. All. That will take a lot of focus upon God, won’t it? And it will mean that we need to constantly be re-focusing on God. I’ve recently be reading the book, Lord, Make My Life a Miracle by Raymond Ortlund Senior. Ray Ortlund Senior was the Bible teacher on the Haven Broadcast for many years and his son was one of my professors at seminary. Dr. Ortlund just died a few weeks ago and I was reminded of his book, and decided to read it. I’m glad I did. And it began to change that church. I know that I need to re-focus on God. How about you? I’ve recently been convicted that I need to focus on God in His threeness and His oneness. You know that God is a trinity, do you not? And I’ve recently been convicted that I’ve forgotten His threeness and His oneness. And I want to give more attention to worshiping Him privately and publically as the Three in One. In what ways do you need to re-focus on God? For example, do you have a regular appointment for one-on-one time with God? If not, you need to re-focus. Some people call them quiet times (but they can be loud!). Some people call them devotional times. Some people call them personal Bible studies. Whatever you call it, we all need to have regular appointments for one-on-one time with God the Father, God the Son, and God the Holy Spirit. And you can do a lot of things with that time. There are various spiritual disciplines and holy habits that you can work into that divine appointment. But at heart, you need to do at least 2 things: talk to God and listen to God. Talk to God in prayer and listen to God in His Word. Re-focus on God by meeting with God regularly. Do you agree with me on that? Okay. When are you going to do it? Write down right now when your next appointment will be. Now, there are a lot of different directions that we could take this morning, but I want to get to next foci (or focus-point). #2. WE NEED TO RE-FOCUS ON THE CHURCH. Turn with me to the letter to the Hebrews chapter 10, starting in verse 24. Hebrews chapter 10, verse 24. Pew Bible Page #1191. The Hebrew Christians that this letter was addressed to were starting to get discouraged because of some persecution. And they were considering giving up on Christianity and returning to orthodox Judaism. So the author of this letter has been encouraging them to re-focus on Jesus and how much better He and His New Covenant are than the Old Covenant ever was. And in chapter 10, he calls them to persevere in participation in the local church. Verse 24. Christ is coming! And as that day gets closer and closer, we need to not give up the fellowship of the local church, instead we need to draw closer to each other and meet together to encourage one another and spur one another on toward love and good deeds. We Need to Re-Focus on the Church. We can’t just focus on God; we must focus on each other. And we need to love each other. Christianity is not a Lone-Ranger Religion. The church is not optional. It is essential. We are not just saved and then find ourselves as a by-product of salvation in the local church. We are saved into the church, the Body of Christ. And the Body of Christ is made manifest in local churches. Do you need to re-focus on the Church? Let me ask you these 3 questions. You might come up with some others. Are you regular in Sunday morning attendance? You need to be. For yourself. AND FOR US! Don’t be selfish here. Notice that Hebrews says that we shouldn’t give up meeting together so that we can encourage each other and stir one another up to love and good deeds. We need you here just as much as you need to be here for yourself. #2. Are you connecting with other believers? Not just are you here on the pew. But are you connecting with other believers so that they are in your life and you are in their lives? “Number Two: commit yourself to the body of Christ, to be in a regular small group of believers, small enough that you can be personally accountable to them for your growth, and personally responsible for their growth” [ibid, pgs. 2-3]. Do you have something like that going on? It wouldn’t have to be an official Link Group of our church, though I’d love to see about 5 or 6 of them start this Fall. Some for empty nesters, some for young 20somethings that are just starting out, some for whomever is looking for fellowship. But it wouldn’t have to be an official Link Group. Are you connected with other believers in the Body of Christ? We need to re-focus on the church so that we have more biblical fellowship happening in our local body. You can’t do all of that in one big Sunday morning meeting every week. We need to get into each others’ lives so that we can obey these verses. What are you going to do about it this week? Write down your plan for getting connected to other believers in the local church. Here’s the third diagnostic question. #3. Are you serving the Lord in the local church? Do you have a place to serve? Remember last week when Wally told us that when Jack Kelly was the pastor here nobody just sat on the pew. Everybody worked. And I said that we were re- instituting that right away. Re-focus now. What is your job at church? If you don’t have one, I’ll help you get one. It’s time to get signed up for Fall programs. We need small group leaders for children. We need helpers for the Wednesday night youth group meetings. We need people to serve as greeters and ushers and attendance-takers and worship team members and Link Group leaders and hosts and a lot of other things that we haven’t even thought about yet. We need what you have to offer. Everybody needs to know what their spiritual gifts are and put them to work in the Body of Christ. We need to re-focus on the local church. And number three. Yes: last, but not at all: least. #3. WE NEED TO RE-FOCUS ON THE WORLD. Our church does not just exist to worship. Our church does not just exist for ourselves. We also exist for the world. To love and reach the world. Jesus said that we need to love our neighbors. That’s not just the person over the pew. It’s the person over the cubicle wall, the person over the fence row, the person at the next desk, the next locker, the person across the street and across the world. We Need to Re-focus on the World. Turn with me back to Matthew chapter 9. Jim Culbertson took us here. We were here two weeks ago. I don’t think we can get away from it. Matthew chapter 9, starting in verse 35. Pew Bible Page #964. Here was Jesus’ heart. And I know it needs to be ours, as well. Jesus had a focus on the world, on the harvest field. And we’ve been listening to messages in Sunday School about loving those we’d rather avoid in our Samarias. We’ve got to do that. We’ve got to break out beyond the four walls of our church and not just love those who are like us, but love the last, the least, and the lost. Those who are different from us, distant from us, sometimes distasteful to us, and often discarded by us. And we’ve got to go to them with the gospel. The Church Is Jesus’ Worshiping Community of Gospel-centered Disciplemakers. Notice that it is Jesus’ church. Jesus said, “I will build MY church” and nothing will stand against it. It’s Jesus’ church, and He has laid out how He wants it to function. Notice that it is a worshiping church. The church focuses on God. God is loved with all our hearts, all our souls, all of our minds. And it is also a community. We focus on each other. We connect to each other like joints and ligaments. We hold each other accountable. We love each other and encourage each other daily as we see the Day approaching. But we don’t just exist for worship and fellowship. We are called to make disciples of all people. We are called to believe the Gospel, live the Gospel, and take the Gospel to all people to include them in Jesus’ worshiping community of disciplemakers. OUT-Reach is not optional. It is a necessary part of our mission. We must see people like Jesus did. “Harassed and helpless, like sheep without a shepherd.” And we need to introduce people to the Good Shepherd. If you don’t know Jesus Christ as your Shepherd, it is our privilege to commend Him to you. He died on the Cross to save you from being harassed and helpless. From being the last, the least, and the lost. From being a rebel against a Holy God. To being brought into His own community, His own flock. We invite you to trust in Jesus Christ as your King and Rescuer and Good Shepherd. You will never regret it and you will be thankful for all eternity! And we all need re-focus on sharing this Jesus with the world. “Number three: commit yourself to the world, to your work in this world, and to your witness to it. Make it specific enough to vow to love one person to Jesus and into the fellowship of the church by next Easter” [ibid, pg. 3]. Could you make a commitment like that? This last week, I had my annual performance evaluation from our Leadership Board. They care enough about me to meet in advance and think of the things that I need to hear about how I’m doing as your pastor. And then they lay out for me my strengths and weaknesses and where I’ve been improving and where I still need work. And they asked me this week a key question that I needed to hear. They asked what is my commitment to loving the lost in our community? What am I do practically to lead the church by example and to be personally obedient to the Great Commission within our community. Pastor Kelly worked in the coal mines and drove a school bus. Pastor Josh Perry works at Starbucks one shift a week to rub shoulders with the lost. Pastor Eric Tober hangs out with the Penn State Basketball Team. What does Pastor Matt do to be out in the community connecting to and loving the last, the least, and the lost? And I didn’t have a good answer. I have a couple of ideas, but I’m not where I need to be. I need to re-focus. How about you? Do you need to re-focus on the world? And while that’s not our only focus, it’s one that we desperately need to sharpen. I was thinking this week about how we used to have a bunch of teenagers that did donuts in our parking lot and drank out there on Friday and Saturday nights. I think our church campus was a good meeting place out here in the woods. I used to be writing my sermons in the evening on Saturday nights, and I’d see those hooligans out in the parking lot hanging out. And I remember telling the board about them, thinking that they might be concerned about the property and might need to have the police drive by occasionally, and so on. And I remember thinking, this church is a special church. That’s unusual. That’s the right mind-set. And we need to continue to re-focus with that mind-set. We need to love the last, the least, and the lost. I loved Jack’s story last week about their church knocking on 100,000 doors in 10 years. Whose door do you need to knock on? Is there someone on your mind and heart right now that you can begin to pray for that they would come to Christ by Resurrection Sunday? It might seem to be an impossible person. Nothing is impossible with God! Let’s do this. Let’s all think of someone that we want to reach out to like that. Or maybe a group of someone’s and we don’t know which person exactly it will be, but we’re going to pray and then get into their lives with the Gospel so that each one will win one to Christ. And let’s do this. Let’s let each other know who that person or group is. Next week, on Back 2 School Sunday, we’ll have a way of writing down those people and focusing our prayers on them together as a whole church. Will you do that with me? We need to re-focus on our triune God. With at least, a regular appointment for one-on-one time with Him. We need to re-focus on the church, the Body of Christ. Not giving up meeting together, but getting into each others’ lives and serving the Body of Christ. And we need to re-focus on the world, loving the last, the least, and the lost. Getting out beyond our 4 walls and reaching our Samaria and the uttermost parts of the world. Introducing harassed and helpless sheep to the Shepherd of Our Souls. Matt Schmucker lifts our gaze. Merritt Anderson reminds me what my priorities need to be. Here are three of the male monkeys working on their own tower. It's really coming along, isn't it? Paul Tripp has switched from Psalm 51 to Psalm 27. Get ready for strong life-changing reflections. 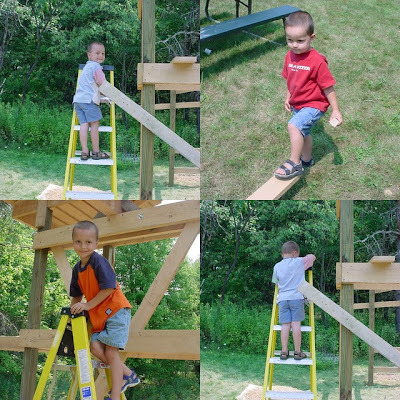 We're building a Mitchell-designed, Mitchell-engineered, Mitchell-made Monkey Tower for my 4 Mitchell Monkeys to climb on. This is from building day #1, laying it out and setting in the corner posts. Boy, are we thankful for some non-Mitchells who helped us. In this picture: Roper Houston, Jr. (contractor) and David Lundeen (brother in law). More pictures to follow. "This Thursday is our big Discipleship Planning Meeting. We will plan out the Sunday School and Way Cool Wednesday ministry for 2007-2008. We will never see the full fruit of our faithful acts in our lifetime; but there will be fruit. There will be children who are changed by God’s grace on Wednesday nights – and they will grow up differently because of it. Their marriages will one day be different because of it. They will raise their children differently because of it. And their children will come to faith years from now, because of our faithfulness this year. How might the community of Curwensville, and Clearfield County, and beyond, be affected by Jesus Christ in the years to come, because of a plan made by faith in Christ this Thursday?" "What Preaching is NOT (and what it is)"
There is a story of three little boys who were sitting around bragging about their daddies. You know, saying stuff like: "My daddy can beat up your daddy" and "My pa is smarter than your pa."
Eventually they got around to the one measure of greatness that matters in today's world: money. One little boy, whose daddy was a doctor, said, "My daddy makes $60 an hour just for looking at people without any clothes on." Another little boy, whose daddy was a lawyer, said, "That's nothing, my daddy makes $120 an hour just for sitting at his desk." The third little boy, whose daddy happened to be a preacher, said, "You think that's a lot, my daddy talks for 15-minutes and it takes four men to collect all the money!" For the jaded, that's what preaching has become, a 15-minute fund raising speech in order to run the rest of the church's programs. The world has seen too many preachers on TV and elsewhere for whom the bottom line has been making money. On the other hand, complaints have arisen that church is boring, or that it is not relevant. And so, attempts have been made to change preaching...to make it more exciting or to make it more practical. The results have ranged everywhere from "drive-thru" churches where an entire service is conducted in 15 minutes and the "worshippers" don't even have to leave their cars; to more "traditional" looking sermons which consist more of jokes and stories than what I would call real preaching. I’m doing a series on “How to Listen to a Sermon” because preaching is an important part of the life of the church. Week after week we gather here to listen to the proclamation of God’s Word. But we don’t think that much about why we have preaching. It’s easy to think, “We have a sermon because that’s the way we’ve always done it.” But that’s not a good enough reason to do anything. So I want to teach you how to listen to preaching, and part of that means helping you understand what preaching is. The sermon today is not going to be like my usual sermons. I have a text, but we’re not going to look at it until we are nearly to the end of the message. It’s kind of ironic, really. Last week I stressed the importance of the sermon being based on a specific passage of God’s Word, and today we’re not going to get to God’s Word until the end. But the passage we will look at will give us a very good picture of what preaching is, and I thought it would be a good idea if we first talked about what preaching is NOT. Because I think there are a lot of mistaken notions of preaching out there, which lead to some poor examples of preaching and set up some mistaken expectations in those of us who do the listening. So, let’s pray, and then we’ll dig into what preaching is NOT. 1. First, preaching is not entertainment. We live in a world of multi-media entertainment. We are a culture that puts a high priority on our leisure time. The movie, television, and theme park industries are multi-billion dollar cash cows. We are accustomed to the very best in entertainment, and if we don't get it, we switch the channel. Unfortunately, we now get church on TV and church on radio. The problem with that is that as soon as you put anything on TV it becomes entertainment. That's the nature of the medium. Moreover, with our cars, we do not think twice about driving 20 to 30 miles to go to a church. So suddenly, with all these various churches and preachers competing for the same market, the pressure is there to deliver something on the same level as the church on TV, or the church down the street. The pressure is there to entertain. Now, I am not trying to excuse boring preaching. I think the Bible is an exciting book, I think the gospel is the most exciting story that anyone can ever hear, and preaching which is dry, lifeless and boring does not do it justice. But, once the priority of a preacher becomes entertainment rather than faithful proclamation of the Word, he has moved into something other than preaching. A friend of mine gave me a great quote, though he could not tell me where he had gotten it. He was pretty sure it was a statement of one of the 17th century English Puritan preachers. The quote goes like this: "We have gone from telling the old, old story to telling stories." Think about that: replacing the old, old story of Jesus and His glory, of Jesus and His love with mere stories. Could we be any more shallow? And if that could be said of 17th century England, how much more true is that of us here in the 21st century? Unfortunately, this replacement of preaching with entertainment cannot be blamed on preachers alone. We are a consumer culture. We comparison shop for our food, for our cars, for our homes, for our entertainment, and for our churches. If the preacher is not making us laugh enough, or not telling enough stories, or just plain not entertaining us, we don't hesitate to find a church or a preacher who will. If all else fails, we can watch the preachers on TV. And so, as we try to define what preaching is, and what it is not, one of the first things we need to set straight in our minds is that preaching is not entertainment. A preacher does his congregation a disservice when he makes entertaining them his first priority, and a congregation does its preacher a disservice when it judges him primarily on his entertainment value. 2. Second, preaching is not moral lessons. We are a very practical culture. We want to know the "bottom line." We want to know what is the best way to live our lives and how we can do it. So often, then, our preaching becomes a sort of how-to guide, filled with moralisms that can be essentially boiled down to: "Be good, be nice, and tell the truth." Instead of preaching about God, we get sermons on how to be like David or how not to be like the Pharisees. We want to have the "Seven Steps to raising a Happy, Healthy 7 year-old." We want the "12 Habits of Effective Living." The "3 Principles of Exceedingly Happy Marriages." But Christianity cannot be reduced to moralisms. It is not less than our moral behavior, but it is certainly more. The Bible is not "God's Handbook of Hints for Happy Living," it is His revelation of Himself. Like author Donald Miller says, you can’t reduce the key to marriage to three steps, or seven, or twelve. It seems more like there are a million keys to a happy marriage, and they change depending on what mood she is in. The church is not a drive-thru, it is a temple. We are called to contemplate what God has said, to meditate on who He is as He has revealed Himself in the Person of Jesus Christ. It is as we encounter Him through His revelation that our lives are transformed. Consider Isaiah, and his vision of the throne room of God in Isaiah 6. He enters the temple, and he gets a load of God, “high and exalted” with the train of his robe filling the temple. There are angels flying around crying “Holy, Holy, Holy is the Lord Almighty; the whole earth is full of his glory.” And the very doorposts are shaking with their cries. There were no moral lessons to be gleaned from that experience. Isaiah did not return to the Israelites with 6 points of application springing out of that experience. That is our aim in preaching--to take people up out of this vulgar world, with which they are entirely too familiar, and lift them up into the presence of God through the expository unveiling of his glories, so that the ministry of the Word becomes a mystical encounter with God himself. When the Bible opens up to us in this supernatural way, we do not apply it, it applies us. Now, don't get me wrong. The Bible does have a moral standard to which we are accountable, and one of the tasks of preaching is to call people to live more holy lives, but we cannot allow preaching to be reduced to that alone. Christianity is more than just a set of rules to be followed, it is a relationship with the living, eternal God. 3. Third, preaching is not a pep-talk. We live in a society where "self-esteem" and "positive affirmation" are buzz-words. We are careful not to step on anyone's toes, we want to build people up, encourage them, not tear them down. This is reflected in much of our preaching. It is not uncommon today to hear preachers who proclaim the "Power of Positive Thinking"--a politically-correct, psychologized sort of theology which basically says: "Your O.K., I'm O.K., let's have a group hug." To me, that sort of preaching resembles a pep-rally. 20 to 30 minutes of rah-rah encouragement designed to make people feel better about themselves and to charge them up for the week ahead. Unfortunately, much of the Bible is not designed to make us feel better about ourselves. In fact, much of it is clearly intended to make us feel very uncomfortable about ourselves. We do not come to church on Sunday mornings--at least we shouldn't-- to receive a pat on the back and a positive affirmation, so that we can go out the next week happy about who we are and what we are doing. We come to hear from God. We come to be challenged, convicted and changed. And for that to happen, sermons sometimes have to get decidedly negative. Of course, there is room for encouragement in our preaching. Because after we confront the changes that need to be made, we find that God in His grace is prepared to change us. The gospel, rightly understood, is the most encouraging thing in the world. But if we don’t confront sin first, we can’t understand the gospel correctly. There is no good news unless you first come to terms with the bad news. And so preachers who only want to score points with their audience by telling them how good they already are do a terrible disservice to those people. Preaching is not a pep-talk. A preacher’s job is not to make people feel good about themselves, but to bring them face to face with the reality of God. 4. Fourth, preaching is not a lecture. We live in the information age. We have thousands and thousands of bits of information available to us in our libraries and via the internet. This is not a bad thing. In fact, it's wonderful. The world is probably as educated now as it has ever been. But there is a danger that we can let our sermons deteriorate into lectures about the Bible and God rather than messages from God. This is a problem which my preaching is prone to. I enjoy learning, collecting information. I like to put an outline up on the screen and then lecture on various points of theology. But I need to remember that Christianity is not about how much we can learn, it is about our relationship with Jesus. It is possible to have large amounts of information about the Bible and about God and still not be in a right relationship with Him. The Pharisees are a prime example. They knew the law inside and out, and yet their hearts were far from God. This is not to say that we should not deeply explore God's Word. I think one of the biggest flaws in American Christianity is that we do not know our Bibles very well. The reason I have been so careful to cover the Bible's inspiration and power is so that we would be reminded of how important studying Scripture is. But we need to remember that the point of preaching is not so that everyone in the congregation will be able to pass a multiple-choice test on the Bible, but so that we will be drawn closer to God. This is one of the reasons I don’t put outlines of my messages in the bulletin. I don’t want to give the impression that the main goal of a sermon is to get the outline complete. I don’t have a problem with it if you find taking notes helps you to focus, and I have made some outlines available on the table outside the south door there, and you’re welcome to pick them up if you feel they will help you; but I want you to remember that the point is to know God, and not necessarily to know the three points on this week’s outline. 5. Fifth, preaching is not an opinion piece. We live in a pluralistic, politically correct environment. We are told that there are no absolutes and that no one has the right to impose their worldview on anyone else. We hear that it is good for us that we believe what we believe, so long as we keep it to ourselves. In this environment, Christian preaching is viewed as the opinion of the preacher. For those who share that opinion, the sermon is eagerly applauded and encouraged. But for those who do not accept it, the sermon is dismissed as easily as one dismisses the opinion that the University of Northern Iowa has the best college football team in America. The standard response is: "Well, that's just your opinion." A response which effectively ends any objective sort of conversation. In this sort of environment the final arbiter is not truth, but likes and dislikes. If you like something the preacher says, then you accept it. If you do not like what he says, then forget it. Maybe next week he will say something that is more appealing to you. But preaching is more than just the preacher's opinion. Remember, we have already said that the source for preaching is the Bible. And if the sermon is drawn from Scripture, then it carries the authority of God's word. Here is the advantage of having an objective, public record of God's revelation such as we do in the Bible. When a preacher claims that the Bible says something, we can all turn to the Bible together and check. If the text pointed to cannot bear the weight of the claims the preacher is making, then perhaps we can dismiss it as merely his opinion. But if the text does support what the preacher says, then the sermon goes from being merely the opinion of one man, to being the opinion of the inspired, authoritative, living, and powerful Word of God. One can still choose not to accept it, but one does so at one's own peril. Christian preaching, when done right then, is not a mere opinion piece, it is the truth of God. So there you have a list of what preaching is not. All of these are things I have observed in American Christianity that I believe are mistaken ideas of what a sermon should be. What then is preaching? What definition can we use to keep us from having the wrong expectations of the sermon? Here’s my definition: Preaching is the declaration of God’s message on God’s behalf. Preaching is one of the unique ways God has chosen to share Himself with the world. It is entertaining, it is informative, it does train us in right living, it does encourage us, and it includes opinions on who God is and what God does. But it is more than all that. It is the Revelation of God and His invitation to salvation to humanity. The key word here is “ambassadors.” You all know what an ambassador is. An ambassador is a representative of one country who goes to another country on his or her country’s behalf. So, imagine if, after the 2008 election, President Obama or President Giuliani or whoever gets elected taps you to be the new ambassador to Borneo. And then, let’s say that after you get there, Borneo becomes the center of a major international incident. I don’t know why, say they discover that’s where all the Weapons of Mass Destruction were hidden. Now, all of a sudden, you’ve got this major role to play. And as U.S. Ambassador, when you speak to the people of Borneo or the Bornean government, you speak on behalf of the entire U.S. Your words are the President’s words. That’s quite a position to be in. It’s a privileged position, because you get to speak on behalf of your country. And it’s also a position of great responsibility. Because you want to make sure your words are in keeping with American policy. And, of course, if you strike out on your own, it won’t take long for the President to yank you back to the States. Well, that’s sort of like being a preacher. We are ambassadors of Christ. God has designed it so that we are declaring His message to the world. He has chosen to speak through us. It’s a position of privilege, it’s pretty neat to think that when I stand up here I’m doing so on Christ’s behalf. But it’s also a position of responsibility. I want to make sure the words I say are not my own, but are in keeping with the message God wants to send to the world. And that’s why I put such an emphasis on expository preaching. On having messages that are explicitly drawn from the text in front of us. Of letting the Bible passage, as much as possible, declare its message in its own way through me. An expository sermon is one whose form, content and intent is determined by the form, content and intent of the text being addressed. If sermons are carefully written in this way, then they will reveal the full truth of God's Word. Moreover, as God's Word is expounded faithfully by a person with real struggles, joys and hurts, preaching will fulfill its incarnational nature. Just like God most fully revealed Himself in the flesh of Jesus Christ, so God still chooses to work through human beings. Preaching is the declaration of God’s message on God’s behalf. It’s as though God is making his appeal through us. And it’s worth noting, in closing, that this verse—2 Corinthians 5:20—isn’t just talking about pastors and teachers. I believe Paul has all Christians in mind when he calls us ambassadors of Christ. In a way, we are all preachers. We may not exposit the scriptures, or stand in front of large groups of people. But we all have the opportunity to declare God’s message on God’s behalf. In the way we live, in the way we speak with those around us, we are all given the privilege and responsibility of making God’s appeal to the world. This is the moment you’ve all been waiting for in the book of Numbers! It’s time to take a census–again! It doesn’t get more exciting than that, does it?! They don’t call it the “book of Numbers” for nothing! As we have seen, it is full of numbers. In this case, numbers of men being counted like they had been in chapters 1 and 2. And actually, this is a very exciting thing. Because it means that the first generation of Israel had died in the wilderness, and God was getting the second generation of Israel was ready again to march into the Promised Land. In fact, there are a lot of exciting things to see here about Who God is, if we crunch the numbers carefully and look with eyes of faith. Numbers chapter 26, verse 1. That’s the plague from last chapter, which we saw last week came from Israelite men hooking up with Moabite women and participating in pagan worship. But Phinehas was zealous for the honor of God and ended the plague with his atoning attack on Zimri and Cozbi. The plague was over, 24,000 Israelites had died, and God was ready to count them all again. Now, let me see if you were paying attention. Which Israelites were being counted? How old? 20 years old and up. We’ve learned that you can tell a lot about a census by who are being counted. This is first off, a military census–just like the first one. How many fighting men are there? Does everybody remember when we did this back in January? I don’t remember how many fighting men there were that day. About 35, I think. Let’s see how many there are today. Stand up and be counted if you are a man 20 years old or older who would be able and willing to fight if need be. Now, in our case, it’s only been 8 months since we took our first census. But in this case, it has been about 40 years. And none of the men counted the first time except for Joshua and Caleb are being counted the second time. Last time, they were being counted at the base of Mount Sinai. This time, they are camped across the Jordan from Jericho–on the plains of Moab, right across from the Promised Land. Then the twelve tribes were counted. Starting with the firstborn, Reuben. This is the most drastic number difference between the two census. In the original census, Simeon had 59,300 men. They have lost 62% of their fighting men. Remember what tribe Zimri was from in the Baal rebellion last week? Simeon. I’m not going to read all of these names this morning. Gad is in verses 15 through 18. His tribe totaled 40,500. Judah is in verses 19 through 22. His tribe totaled 76,500. Notice that his sons Er and Onan are mentioned in verses 19 and 20. Er and Onan died way back in Genesis chapter 38 when they were wicked and didn’t provide a son for Tamar. They didn’t have any kids, but they are listed as warning sign, too. Issachar is in verses 23 through 25 totaling out at 64,300. Zebulun is verses 26 and 27 at 60,500. Joseph’s two half-tribes Manasseh (52,700) and Ephraim (32,500) are counted in verses 28 through 37. There is also a mention in verse 33 of a man named Zelophehad who had only daughters and we’ll learn more about him and them in the next chapter. Benjamin and his clans are found in verses 38 through 41 and totaled 45,600. Dan is verses 42 and 43 with 64,400. Asher is verses 44 through 47 with 53,400. And Naphtali brings up the rear in verses 48 through 50 numbering at 45,400. Does anyone remember what the total was of the last census? Are they very far off? Nope. 603,550. That’s just 3/10ths of a percent difference. We’ll come back to that. Oh ho! So, this census was really important to these people because however many their tribe had today was how much land they got. The larger got larger land. The smaller got smaller land. But it was equitable. The actual locations were chosen by lot. Not one of them except for Caleb and Joshua were the same as those counted 40 years before. Okay, that’s the census. Now, let’s crunch the numbers. What do they mean? What do they teach? What does this census show us about our God? #1. GOD TAKES DISOBEDIENCE SERIOUSLY. Did you notice how many bad names were included in this census? Those guys were bad eggs! This is a new generation! Why do we need to bring those guys up again? Warning! God takes disobedience seriously! The earth may open and swallow you. You may not have any children or grandchildren. You may be struck by lightning. The greatest example of this is the first generation. They all died. Every one of them except for the faith-filled spies, Caleb and Joshua. And entire generation. More than half a million men. Are you living in disobedience? Are you flirting with disobedience? There is no condemnation for those who are Christ Jesus, but there is Fatherly displeasure and discipline. God does wink at disobedience. He takes it very seriously. If you are walking in disobedience, now is the time to repent. Maybe what you are doing doesn’t feel bad. It feels good. But you know that it is wrong. Repentance is a turning away from sin and toward the Lord. It starts in the heart and then works itself out in our behavior. These numbers, these names, this census calls each of us to examine our hearts and to repent of disobedience. Because God takes disobedience seriously. But, praise the Lord, that’s not all this census says! It also says that God is faithful. #2. GOD KEEPS HIS PROMISES FAITHFULLY. But He Also Keeps His Promises Faithfully. Doesn’t he?! The most amazing feature of this census is the total. Despite losing 603,548 men in the wilderness, Israel is still alive and kicking! They have a over half a million fighting men! That’s God keeping a promise, isn’t it? What promise? Offspring, right? From the Abrahamic Covenant? You might have expected after the Retreat of Unbelief, Korah’s Rebellion, and last week’s plague because of Baal, that there would hardly be anything left of Israel. But God always keeps His promises! What are the other promises of the Abrahamic Covenant? Land and Blessing. We saw blessing with Balaam. What about land? Well, that was the point of verses 52 through 56. They aren’t in the Land, yet. But they’re already planning to divide it up. God is faithfully keeping His promises! What should be our response to that? Faith, right? Trusting. That’s what we see in the lives of Zelophehad’s daughters in the first part of chapter 27. Look at v.1. Five daughters, no sons, his family name will disappear, and there will be no property for these ladies. Z wasn’t a follower of Korah, but he didn’t go with Joshua and Caleb either. He died for his own sin. What does God hear in these ladies’ request? They step forward before the leaders of the people! And they believe with all of their hearts that the LAND promise was going to be fulfilled. Are they in the Land yet? Because they are trusting that God is going to keep His promises faithfully. This is not just a glimpse into God’s heart for women or His sense of justice and equity. It is God’s delight in finding faith in these ladies who trust Him to keep His promises. Are you trusting in God’s promises? Do you believe that what God has said He will do? We say that we do, but our actions often betray our unbelief. God has given us everything we need for life and godliness through our knowledge of Him who called us through His great and precious promises. Do you know the promises? Do you know the promise that pertains to the problem that you are going through right now? I’m sure you’re going through some problem right now. Do you know that there are promises that pertain to that problem? Great and precious promises that you can take to the bank that will get you through? You and I need to spend more time in this book mining it for the great and precious promises and then trusting in them through whatever going through. Because this census tells us that God Keeps His Promises Faithfully. We need to be like Zelophehad’s daughters and trust Him. The third (and last) thing I want to show you in these chapters is from verses 12 through 23 of chapter 27. As you can see, we are coming to the end of the book of Numbers and it won’t be long until the events of the book of Joshua begin to unfold. There has not just been a change from one generation to another. There is now going to be a change from one leader to another. One shepherd to another. And that lead me to our last point. #3. GOD GIVES HIS SHEPHERDS GRACIOUSLY. Did you notice the “shepherd” language? Especially in verse 17. Moses has seen himself as a shepherd. And with him going off of the scene, he’s concerned that Israel continue to have a shepherd. A month ago, Jim Culbertson preached on Matthew 9 from this pulpit. And we know that He came to be the Good Shepherd! God was gracious to Israel and gave them a new Spirit-filled leader in Joshua. Just what they needed. Do you know what Joshua’s name means? God gives His Shepherds Graciously! He sees that we are like sheep without a shepherd. It’s helpless! Sheep are dumb. They can get lost walking into an open garage! They need a shepherd or they die. And we are sheep. We are helpless. Lost in our sins. Without hope in this world. But God sees that we are like sheep without a shepherd, and He graciously sends us One. That is what we celebrate at this Table this morning. Jesus, the Good Shepherd, laying down His life for us sheep. He does not wink at sin. He does not leave the guilty unpunished. They are a “warning sign” for us to repent. But He doesn’t stop there for His sheep. He gives them a perfect Shepherd who takes the place of the sheep and lays down His life to save them. If we trust in Jesus and what He did on the Cross, we receive salvation and life to the full. Because He gave what we could never give to pay what we could never pay. And then He took up His life again! And in doing so, He keeps all of His promises faithfully. Every one of them is “YES” in Christ Jesus. As we eat and drink this memorial meal, God is specially present to bless us. Take this time to focus on Him. Look briefly at your own heart and discern if there is any known sin that needs to be confessed and repented of. But don’t stay focused on your heart. Focus on God’s heart and how faithful He is. Thank Him for every one of His promises which He will not fail to keep. Talk to Him about a promise that pertains to a problem you are going through right now. And tell Him that you are going to trust that promise. And focus on God’s heart and how gracious He is. He gave us a Joshua–a Savior so that we would not be like sheep without a Shepherd. A Shepherd who laid down His life for the sheep. Thank Him for the Shepherd and for His blood spilled and His body broken for you. This looks like a good article on how to help pastors' wives in their unique role. Today, he hit #9, and I agree completely because it's been my experience: John Piper. Piper's Hot Orthodoxy has been a deep inspiration for mine. May his tribe increase. Good thoughts about the limitations of this blogging medium from Jack Brooks. Excellent articles on the doctrine of substitutionary atonement in the latest issue of the Southern Baptist Theological Journal (2 of which are online in .pdf). A quote from John Stott in the lead editorial by Stephen Wellum: "The better people understand the glory of divine substitution, the easier it will be for them to trust the Substitute." Anton Chekov was one of the great Russian writers of the 19th Century and he wrote a wonderful short story called "The Bet." The story concerns a rather wealthy Russian landowner who held a dinner party at which a young good-for-nothing was in attendance. One way or another, the conversation swung around to man's ability to live in complete isolation from all other human contact. Most there felt that no one could last a year without becoming completely mad. The young good-for-nothing, however, felt it could be done and rather brashly asserted that he himself could do it. And so, a bet was made. The landowner had a hunting cabin which would be completely sealed with the young man inside of it. He would be brought food through a slot, but would not be spoken to. His one contact with the outside world would be that he would be given access to all the books he could want or request. A ribbon was placed on the door, which, if broken would prove that the young man had left the cabin. If, however, he managed to stay for an entire year without becoming mad, the landowner would give him an extraordinary amount of money: something like $10 million in today's world. The young man entered the cabin. At first he spent his time reading the great philosophers: Plato and Aristotle. Then he began to read the great humanists of the Renaissance. From there he moved into the great Russian authors. Eventually he became tired of reading though, and slowly began to feel himself slipping into despair and madness. As the days dragged by he began to seriously consider walking out the door. And then, one day about 2 months before his deadline, he picked up the Bible. Soon he stopped reading anything else and his spirit again soared. Over the next two months he read the Bible over and over again, until, finally, it was only 1 day until he would win the bet. The landowner, by this time, was distraught, for it was evident to him that he was about to lose a fortune. But then something remarkable happened, the young man took his Bible and left the cabin. He had become so convicted by what he had read in Scripture that he decided to forsake the money and become a follower of Jesus. That is the extraordinary power of God's Word to change a life. It is just a fictional story, but it illustrates the unique property that this book has. More than a collection of ink and paper and binding glue, the Bible is how God communicates with humanity. Last week I started a new sermon series called “How to Listen to a Sermon.” I’m trying to give you some insight into the things that I’m passionate about, and preaching is one of them. But we don’t always spend a lot of time thinking about why we gather week after week to listen to one person doing all the talking. So last week, we looked at Amos 8 and saw what happens if there is a famine of hearing God’s Word. We saw that regular preaching provides us with direction, gives us life, and calls us out of darkness. Now, this week, I want to think about the source of our preaching. I want to talk about the Bible. Because preaching doesn’t get its value from the person who is up front doing the talking, or from the church, or from the audience; preaching gets its value because preaching comes from the Bible. Sermons are important because they are based on this book that has this extraordinary power to change lives. In fact, that’s the main point of my message today: Because the Bible is God’s Word, it has the power to change us. That’s what I hope you’ll be able to remember from our time together today: because the Bible is God’s Word, it has the power to change us. And the passage of scripture that teaches us this truth is 2 Timothy 3:16-17. I invite you to turn in your Bibles to 2 Timothy 3:16-17. 2 Timothy 3:16-17 is THE great Bible passage for helping us to understand the nature of our Bibles. If this passage didn’t exist, we’d still be able to learn that the Bible is God’s Word, but no other passage says it as clearly as this one. So the message, again, is this: Because the Bible is God’s Word, it has the power to change us. There are two main ideas in that statement, and we’ll consider them both in turn. First, the Bible is God’s Word. And, second, the Bible has the power to change us. Now, I’m not the kind of preacher who likes to use Greek words a whole lot, but in this case I think it might be helpful. The New Testament was originally written in Greek, which was like the international language of the time. What we have in English, of course, are translations of the original Greek. Translations which have been scholarly researched and checked and rechecked by thousands of experts. So we can trust what our English versions say, but sometimes going back to the original Greek word can give us a little more sense of the meaning. In this case, the word that is translated “God-breathed” is a compound Greek word theo-pneustos. We can see the meaning of the word by breaking it into its component parts. You probably already know that theos is Greek for God. It is the root of our word "theology", which is the study of God. And pneuma is Greek for "breath." Thus our words "pneumonia" and "pneumatic." So the word means "God breath". And the thing for us to notice is that the words are arranged in such a way as to indicate that the scriptures have been breathed out by God. It doesn’t say that the Scriptures breathe God to us, but that the scriptures are the product of God's breathing. In other words, the scriptures are God’s Words. Another way of saying this is to say that the Scriptures are inspired. That’s the word theologians use. Inspiration is the doctrine that says that God is the ultimate Author of the Bible. Now, that doesn’t mean we believe that the Bible dropped out of heaven on golden tablets (like the Mormons believe about the book of Mormon), or that God grabbed hold of somebody and dictated exactly what He wanted written down (like the Muslims believe about the Koran). We recognize that the Bible is a collection of works by several different authors, written over a period of some 4000 years. As you read the different parts of the Bible, you can see the individual personalities, styles and talents of the human authors emerge—the poetry of David, for example, or the logic of Paul. And yet, God chose to progressively reveal Himself to a number of human agents, breathing out His scripture in such a way that even as they wrote, He supervised the process to get exactly what He wanted to communicate to us. If Moses and Luke are authors of the Bible with a little “a”; then God is the Author of the Bible with a capital “A”. And so, when we are reading from our Bibles, we can say with extreme confidence that we are reading God’s Word. This has implications, of course, for how we respond to what is written in the Bible. It doesn’t work, for example, for us to say: “Well, God hasn’t come to speak with me personally, so I can’t really be sure what He wants me to do.” He has told us, it’s in the Bible. Think of the analogy of parents who leave a note instructing their teenage son to take out the garbage and clean the house when he gets home from school. It doesn’t work for him to say that they weren’t there to tell him directly. The note carries their authority. Similarly, the Bible carries the authority of God--He wrote it. His words carry the same weight whether they are read in the pages of His Holy book or if He would come and physically stand before us and speak. To disobey or disbelieve anything written in the Bible is to disobey and disbelieve God. Now let’s think about the other half of our main idea. Because the Bible is God’s Word, it has the power to change us. Verse 16 goes on to tell us that Scripture is “useful”. Other English translations use the word “profitable.” In other words, great benefits come to those who listen to God’s Word. As another example of God’s grace, He has given us the Bible to make us into the people He wants us to be. Like the story of the Bet, God’s Word has the power to change us. And as I look at this passage, I see a list of six ways Scripture has the power to change us. Six ways the Bible is useful for us. 1. First, scripture is useful for teaching. Teaching. The Bible is where we learn facts about God. It teaches us that He exists, that He is the creator, that He is the ruler and judge of the universe. We need Scripture to get our doctrine right. It is through Scripture that we learn God’s will for us. 2. Second, scripture is useful for rebuking. Rebuking. This is a word that has to do with the conviction of a sinner. Not only does the Bible tell us the truth about God, it also tells us the truth about ourselves. Like a light shining into a dark place, the Bible shines into the hidden parts of our lives and points out our shortfalls. It convicts us of our sins. And shows us our need of a Savior. But the Bible doesn’t just show us our sins and then leave us to feel guilty about them. It wouldn’t be a very appealing book if all it ever did was tell us how bad we are. It also teaches us how to turn around and do the right thing. 3. That’s the third way scripture has power to change us. Correcting. Scripture is useful for correcting. The word here means “to restore to an upright position”, kind of like the stewardess tells you to do with your seat back before the airplane lands. The idea is that once we see our sin, the Bible is also helpful for helping us to turn away from it, to replace sin with good, to get back to God’s original design for us. 4. So the Bible has power to change us by teaching us, rebuking us, correcting us, and then, fourth, by training us in righteousness. Scripture is useful for training in righteousness. The idea here is also one of education. But where the word “teaching” has to do with passing on facts, the word “training” has more to do with character development. This is the maturation of a Christian into the habits and lifestyles of righteousness. The process of becoming more and more like Jesus. 5. Then, fifth, Scripture is useful for equipping us for good works. This is the point of verse 17. The Bible equips us. God’s goal is not just to teach and rebuke and correct and train us so that we can be super spiritual hermits out on a holy hill somewhere. He has a purpose. He’s designed us to do good works. To love our neighbors as ourselves. To look out for the widow and the orphan. To have compassion on the prisoner and the poor. And it is the Bible that equips us for all that. It is the Bible that sends us out to be salt and light in the world. So you can see the progression here. It’s almost like Paul is describing a step by step process by which God uses the Bible to change us into the people He wants us to be. 15From infancy you have known the holy Scriptures, which are able to make you wise for salvation through faith in Christ Jesus. 6. The sixth, and most important, way Scripture is useful to us is by making us wise for salvation through faith in Christ Jesus. It’s in the Bible that we here the old, old story of Jesus and His love. It’s in the Bible that we are called to put our faith and trust in Him and Him alone. It’s in the Bible that we discover God’s amazing grace at the cross and the new life of the empty tomb. And so, I say that because the Bible is God’s Word, it has the power to change us. The God-breathed Scriptures are the communication tool God uses to reveal Himself and His message of salvation to the world. I am told that once, when the Communist Soviet Union was still intact, a Soviet official was asked why study of the Bible was frowned upon in his country, and why those who dared to print and distribute it were severely punished. His reply, "We find that the reading of the Book changes people in a way that is dangerous to our state!" The Bible is powerful. It convicts, it challenges, it changes people. Another story is told of a college professor who visited the Fiji Islands. He was an agnostic who didn’t have time for religion. He said to the elderly chief of the tribe he was visiting: "You're a great leader, but it's a pity you've been taken in by those foreign missionaries. They only want to get rich through you. No one believes the Bible anymore. People are tired of the threadbare story of Christ dying on a cross for the sins of mankind. They know better now. I'm sorry you've been so foolish as to accept their story." That is the power of the Bible. It has the power to make the foulest clean. To redeem the reprobate. To convict us all of our sin and to lead us to Christ. Scripture has power. So what does this mean for us? It’s a nice theology lesson and all, I think it is important to know what we believe about this book that is so important to our faith; but is there any practical payoff? What’s the application of this passage to our lives? In particular, what’s the application for how to listen to a sermon? I see two applications here. One is for me, the preacher. And the other is for all of us who listen to sermons. First, the application for any who would stand in front of God’s people is this: preach the Word. The job of the Christian preacher is not to air personal opinions or to echo the conventional wisdom of the time, but to proclaim God’s eternal, authoritative Word of truth. My goal when I preach is that everything I say not only be supported by what is written in the Bible, but is actually derived from what the Bible says. Only the Bible can legitimately claim to be God's true revelation and therefore only the Bible has any business being proclaimed from Christian pulpits. I will use science and history and personal experience to support and illustrate the Biblical concepts, but ultimately the only preaching which has any authority is that preaching which declares God's word. There is a story I have heard of ancient Athens. The city, you may remember from your world history classes, was a longtime rival of Sparta. And once, when the Spartans were preparing to again wage war, a city wide meeting was held to prepare the Athenians for battle. The two greatest speakers of the day were brought forward to give the pre-battle pep talk, if you will. The first spoke with great eloquence and skill, and when he finished people said, "My, what a fine speaker." The second, however, spoke with great passion and conviction, and when he finished the people cried, "Let us go to defeat the Spartans." I am convinced that if I am to be considered a good preacher, it will not be because I am a polished speaker, but because I let the Scriptures speak for themselves. The point of preaching is not to impress people with the ability of the speaker, but to impress them with the power of God. To move them, not to praise the preacher, but to praise God. To send them home, if your will, prepared to fight the Spartans. The second application, then, is for those of us who listen to sermons. And the application is this: listen for the Word. Your job is to listen for the Word of God in the sermon. Paul is saying that, on our own, we really don’t want to hear from God. Instead, itching ears start to long for messages that don’t try to change us, but allow us to be comfortable with what we are. And there are plenty of preachers out there willing to scratch itching ears. The caution for us is to exercise a measure of discernment when listening to a preacher. Ask yourself, "Is the power of this man's speaking coming from him or from God's Word?" We live in a world that is impressed by the flashy and the talented. We are drawn to the great storytellers and the great comedians. There is room for both in Christian preaching, but not in place of God's Word and its power to change us. Before you choose to listen to any man or woman’s ministry, including mine, ask yourself: "Does he preach in such a way that shows he believes God's Word is powerful or does he preach in a way that would indicate he feels the Bible is not enough?" And as you listen be a critical listener. Last week I encouraged you to be active listeners, and part of that means thinking critically with what you are hearing, and checking to make sure it squares with the Bible passage in front of us. Because if I come up here and just give my opinions, you can take it or leave it. But if I come up here and help you to see that this is, indeed, what the Bible says, then it is God’s Words that you are hearing. And God’s Word has the power to change your life.